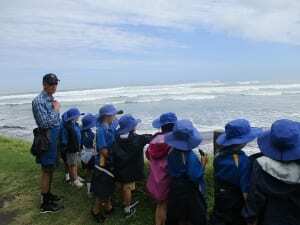 Ficino School > News > Featured > Year 3 Ficino School students enjoy school camp! Year 3 Ficino School students excitedly gathered outside the Villa one cloudy Thursday morning – overnight bags were packed and there was lots of chatter. 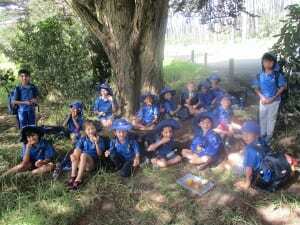 It was time for the annual Year 3 camp out in Kumeu at the Auld’s farm! The adventure began in earnest on arrival at the farm as they set about putting up their accommodation for the night – tents! What a spectacular place to have some outdoors fun at the farm – over the course of the 2 days, students had the opportunity to meet all the farm animals including alpacas, chickens and an old horse, not to mention Sugar, the friendly family Border Collie. There was even plenty of wild rabbits and pukekos to spot! “They were running up and down sand dunes, rolling in sand, cartwheeling, swimming, jumping and playing with the adults and each other. It was an absolute joy to see young kids allowed to be kids. To be playing, be silly, and interact with our beautiful outdoors in such a natural and unstructured way…. Yesterday your kids were learning, and creating memories that they will hold dear for many years to come”. The children returned to school on Friday afternoon, exhausted but with a new confidence in themselves and a strengthening in their friendships with fellow students and their teacher.